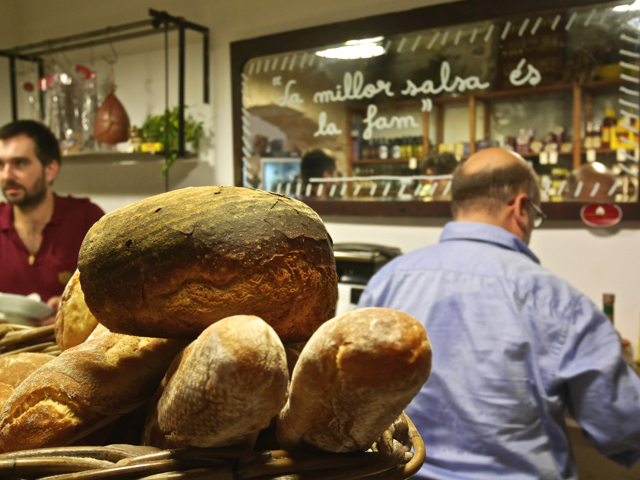 There is a narrow store at the end of Sant Jaume – open its heavy wooden door, and enter paradise. If La Mirona were a Deli in New York City, people would make reservations a month ahead just to get a place at one of the three small tables. 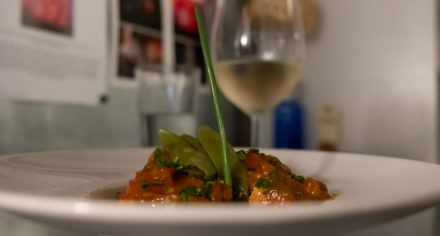 And to relish whatever Pedro Armengol prepares and serves in his tiny open kitchen, together with fresh bread, olive oil, and a glass of good wine. 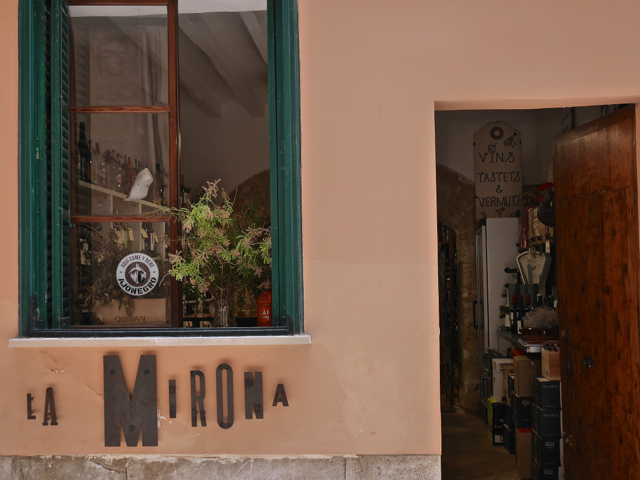 La Mirona is also a traditional grocery store. So you may just walk in and pick up some of the delicious fresh products Pedro offers: fruit, vegetables, cheese and ham, olive oil, and an impressive choice of high-quality tinned or preserved delicatessen. Not to forget the exquisite selection of wines. There is no menu, but Pedro will tell you about the specials of that particular day. 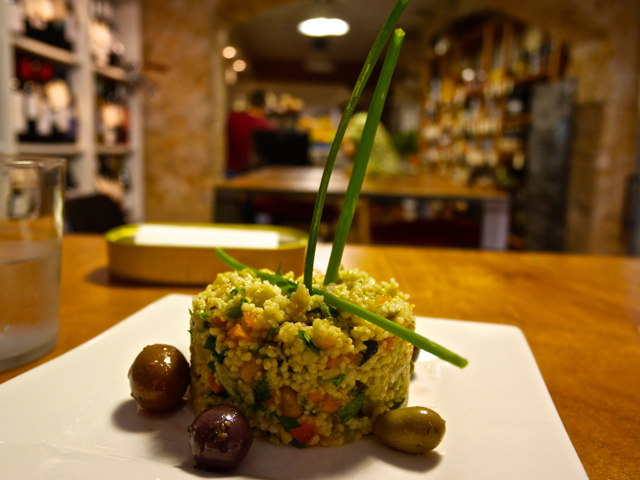 If there is couscous with chick peas and olives available, go for it. If you like sea food, the combination of pulpo and alcachofas is luscious. And I just love his mouth-watering pork-ribs that come in a sauce of oil and mustard. He will take care you always have enough bread to soak it all up, so not a drop is going to waste. Pedro’s cooking and the atmosphere of his small espai gastronòmic reminds me of my very first lunch at the parent’s house of an old friend in Italy. I could taste the sun that grew the vegetables, and the love that was added to their cooking. 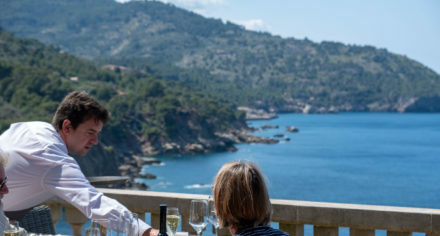 If you are lucky you might meet my friend Tony here, who runs La Principal and also works as a DJ – he lives right around the corner and is a regular at La Mirona. Otherwise just pay him and his partners a visit at at his shop and indulge in Palmallorcastyle.